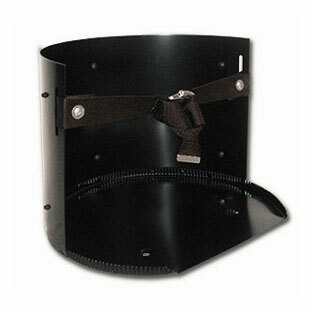 PRODUCT: Heavy Duty Solid-Steel 6 to 15 Gallon Utility Rack with Adjustable Cinch-Buckle Strap and Zinc Plated Buckle. BLACK Color. Fits 6-15 gallon water coolers and large buckets, tank, etc. Price/Each. Fits most 6-15 Gallon water coolers, including Igloo models 3051, 4101, 3101, 6101, 3151, and 51019552. Dimensions: 16.6" x 16.6" x 11.0". Maximum diameter which can be held is 16". Do not confuse these with the cheap light-duty wire-racks. Built for long-term, tough duty. Constructed with solid heavy-gauge .050" steel & powder coated with a weather resistant coating. Heavy poly web strap is designed to hold full coolers in place, even during rough travel. The steel strap latch is yellow-zinc coated. 3 to 5 Gallon Heavy Duty Solid Steel Cooler / Utility Rack with UV resistant cinch-buckle strap. Fits 3 to 5 gallon water coolers, oversized paint buckets, propane tanks, steel gas safety cans. Made in USA. BLACK COLOR. Price/Each. #9550 Heavy-Duty Solid Metal Utility Rack with adjustable cinch-buckle strap and Rear Wall Mount Brackets. For Water coolers or paint buckets. Made in USA. Price/Each.